My opening claim is that the body is the first, central and conflictive space for women defending their place, in this case the Cooperativa Mujeres Ecologistas de la Huizachera Ecologist Women of La Huizachera Cooperative (COMEH)(COMEH [Ecologist Women of La Huizachera Cooperative]) appropriate in their defense of place. 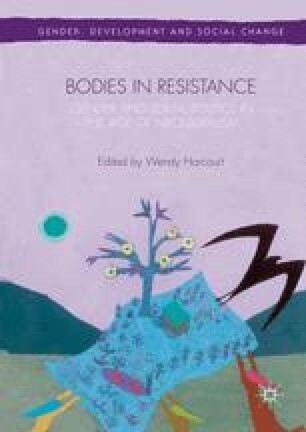 This includes claiming the right to construct themselves as bodies and subjects, a process which has a complex social nature because the bodies and identities of these women are traversed and constructed by power relations, practices, discourses and meanings that permeate their community, family and social public space (Harcourt and Mumtaz 2002; Underhill-Sem 2002). Giménez, G. (1996). Territorio y cultura. Estudios sobre las culturas Contemporáneas, II (4), 9–30. Retrieved from http://www.redalyc.org/pdf/316/31600402.pdf. McCulligh, C. (2013). La no regulación ambiental: Contaminación industrial del río Santiago en Jalisco. Observatorio del desarrollo, II (7), 22–29. Retrieved from http://estudiosdeldesarrollo.net/observatorio/ob7/5.pdf.